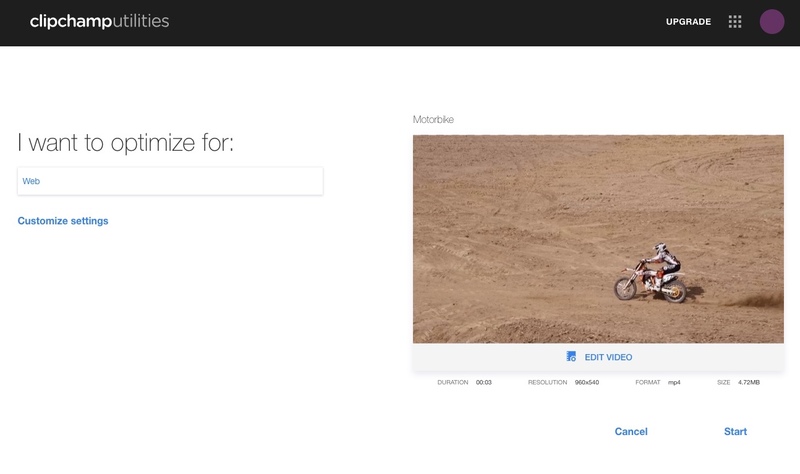 Then sign in and click Convert my video in the dashboard. For detailed instructions with images, see below. Conversion and compression happen in the same process. So after you select a video file and choose your settings and click START, your file will be compressed (if you've chosen to reduce resolution or quality) and converted (if you've chosen a different output format) in the same step. You can then save it to your computer or share it. Your videos never get uploaded (unless you choose to share them) and we never have access to the files – it all happens on your computer. We recommend accessing Utilities in the latest version of Google Chrome for best performance. 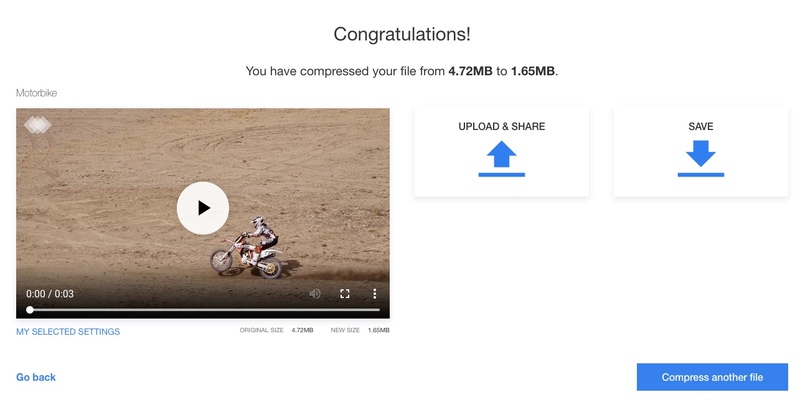 Choose a video file from your computer OR drag and drop a file into the Convert my video area. 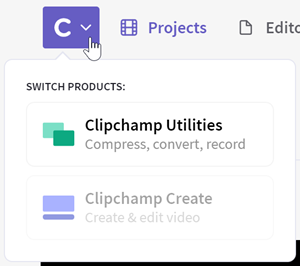 NOTE: If you're accessing Clipchamp Utilities in Google Chrome, you can even select and convert several videos at once. Once your file has loaded it will appear in the dashboard. Information about the video will be shown underneath it, including your video file's current duration, resolution, format and size. You can leave the preselected default options and your video will be converted to an MP4 file with standard web compression. 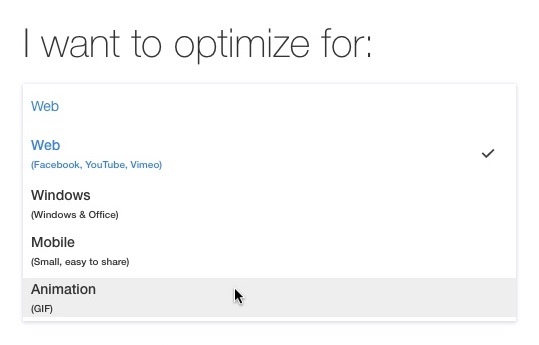 Under "I want to optimize for:" choose what you intend to use your video for (e.g. uploading to web, adding to Windows programs like Powerpoint, viewing on mobile, creating a GIF animation). To compress a file (reduce its size), adjust the Quality and/or Resolution setting in the drop down. The lower the quality and resolution, the smaller the resulting file size. If you want to make the file as small as possible, we also recommend choosing the Mobile setting under optimize. To convert a file (change it to a different video format), choose the Format you would like to convert it to. If you want to convert a file with no visible quality loss, choose keep resolution and high quality. 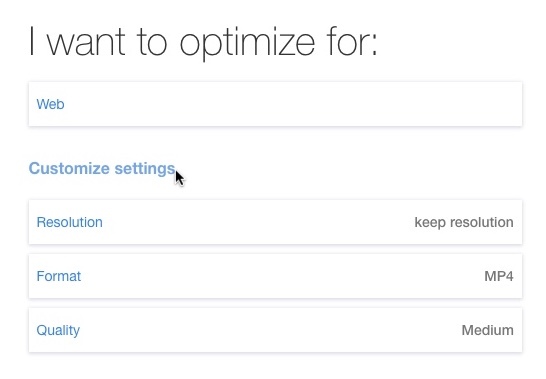 Your optimize setting can sometimes restrict your format options, so if you want a different format from the ones listed, choose a different optimize setting (e.g. choose Windows for WMV ASF). If you would like to make changes to the video, e.g. 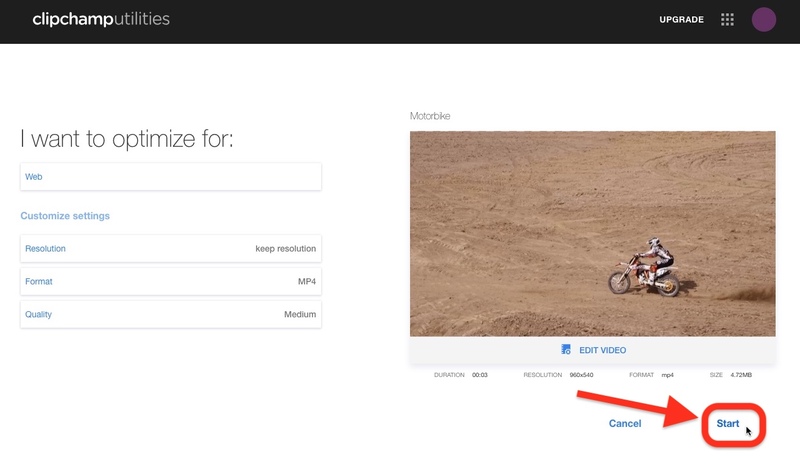 trim a few seconds off the start or end, crop it, flip it, rotate it, or adjust the brightness, click EDIT VIDEO and make the adjustments you want. Once you've finished adjusting your output settings and making edits, click Start in the bottom right underneath the video. 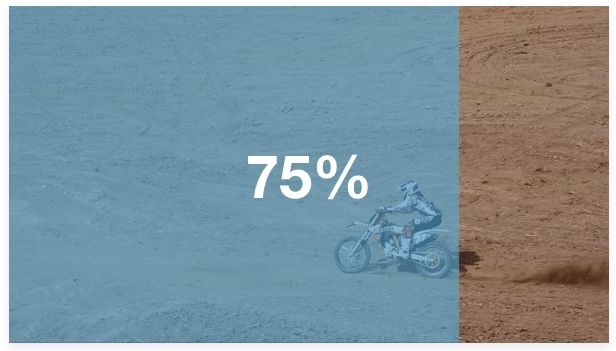 The conversion and compression may take some time depending on the video's length, size, settings, and the computer you're using. When your video has finished converting, a Congratulations! screen will appear that lets you view your converted video. If you're using the free version, there will be a small watermark in the top left of the video (as shown above). To remove the watermark, you can upgrade to the Utilities Business Plan. Click SAVE to save the converted video to your computer. 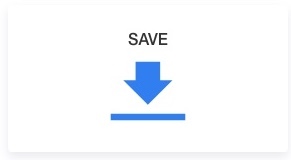 In most browsers the default settings will mean the file automatically saves into your Downloads folder. PLEASE NOTE: the Save button might not work in older versions of Safari due to a bug in this browser. See this related help article for how to solve this. 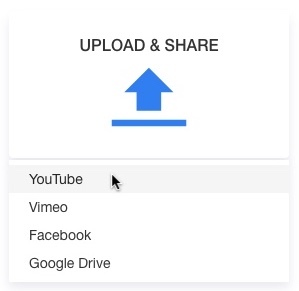 Click UPLOAD & SHARE to upload the converted video directly to Google Drive, Facebook, YouTube or Vimeo. PLEASE NOTE: you will have to disable Ghostery, Adblock Plus and similar extensions in order for the direct video uploads to work correctly, in particular YouTube and Google Drive. If you would like to be reminded what output setting you chose, click on MY SELECTED SETTINGS. If you would like to compress or convert the same video again from scratch (e.g. with different output settings), click Go back. If you're experiencing problems using Utilities or your video doesn't convert, please see: What to do if Utilities doesn't work.